Steve Nightingale played his junior hockey in Peterborough and eventually went on to appear for the Islanders in the ENIHL’s top tier between 2002 and 2004. He would return to the Cambridgeshire outfit again for 2006/07 whilst more recently he has dressed for the Medway Madness, Westminster Statesmen and London Rangers recreational sides. Whilst icing for the 25 year old Rangers, Nightingale faced opponents with NCAA (National Collegiate Athletic Association) Division 1 experience, as well as former professional skaters from France, Norway and the UK. 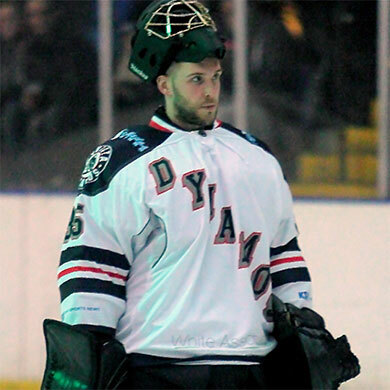 Meanwhile the shot stopper has been passing his knowledge on to others by working as a coach during the summer at the Nathan Craze goaltending camps and in 2014/15, as well as facing the NIHL’s best first hand, he will help train the Invicta Dynamos goalies of the future by aiding the junior setup. “Steve has been training with us on and off for a couple of seasons now but last year he really caught my eye. His game has come on leaps and bounds over the past 12 months and I believe he is more than capable of playing in this league. In addition Steve has committed to helping out the goalies that play for the juniors and I’ve no doubt his influence will help bring out the best in each of them whilst maximising their potential”.